Born in North Philadelphia, Pennsylvania in 1946 to parents La Java and John, Francis grew up in the city with one brother, Dwayne. He spent many summers working on his aunt and uncle’s farm in rural Virginia, an experience he later described as formative. In the 1960s, he moved to Marin County, California, north of San Francisco. The collision of two oil tankers in San Francisco Bay on January 17, 1971 changed the course of Francis’ life. The environmental destruction wrought by the crash and subsequent spill inspired his decision to avoid motorized vehicle transport. In its place, he began walking, first locally, then to San Francisco (a 40-mile trip), and eventually across the country and then to South America and beyond. On his 27th birthday in 1973, Francis also decided to take a vow of silence, a commitment that lasted seventeen years. During this period, he earned a B.S. degree from Southern OregonState College; a Masters degree in Environmental Studies from the University of Montana-Missoula; and a Ph.D. in Land Resources from the Gaylord Nelson Institute for Environmental Studies at the University of Wisconsin-Madison (1991). In 1990, Francis ended his period of silence and accepted a position as project manager for the United States Coast Guard Oil Pollution Act Staff. Working in Washington, D.C., he wrote oil spill regulations following the disastrous crash of the Exxon Valdez in Alaska. In recognition of his efforts, Francis received the U.S. Department of Transportation’s Public Service Commendation. In 1991, the United National Environment Program appointed Francis as a Goodwill Ambassador to the World’s Grassroots Communities. Francis is the founder of Planetwalk a non-profit environmental awareness organization as well as the first ever National Geographic Society (NGS) education fellow. In 2005, he published Planetwalker: How to Change Your World One Step at a Time (later republished by the NGS as Planetwalker: 17 Years of Silence, 22 Years of Walking). In 2010, the NGS released his work The Ragged Edge of Silence: Finding Peace in a Noisy World, which examines the power of silence through historical analysis, personal anecdotes, and cross-cultural study. From 2011-2012, Francis served as a visiting associate professor at the Gaylord Nelson Institute for Environmental Studies, at University of Wisconsin-Madison. He currently lives near the Point Reyes National Seashore in California, and continues to organize regular planetwalks in the United States and abroad. 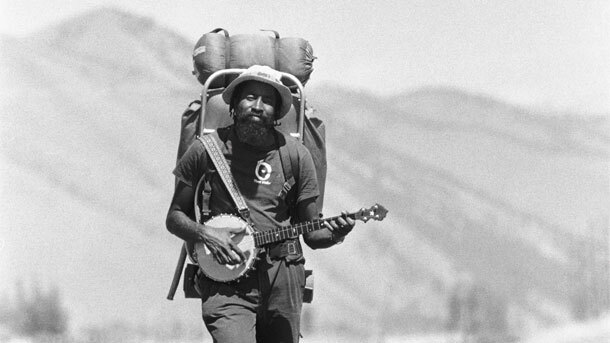 Bill Donahue, "Walking the Talk," Backpacker 36, no. 6 (2008); John Francis, Planetwalker (Washington, D.C.: National Geographic, 2008); Daniel Fromson, “A Conversation with John Francis, Planetwalker and Conservationist,” The Atlantic, March 28, 2011, https://www.theatlantic.com/national/archive/2011/03/a-conversation-with-john-francis-planetwalker-and-conservationist/73126/; Jonathan Rowe, "The Man Who Said Nothing," The Ecologist 5 (2008). Bill Donahue, “Walking the Talk,” Backpacker 36, no. 6 (2008); John Francis, Planetwalker (Washington, D.C.: National Geographic, 2008); Daniel Fromson, “A Conversation with John Francis, Planetwalker and Conservationist,” The Atlantic, March 28, 2011, https://www.theatlantic.com/national/archive/2011/03/a-conversation-with-john-francis-planetwalker-and-conservationist/73126/; Jonathan Rowe, “The Man Who Said Nothing,” The Ecologist 5 (2008).